Meet Detroit's Youngest Entrepreneur -- And She Started When She Was Just 5! 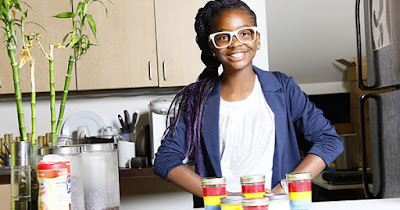 Asia Newson has a very simple slogan for her company, "I Sell the World's Best Candles." She started her company, Super Business Girl, when she was only 5 years old, with her parents help. Now, at the age of 13, she is known as Detroit's youngest entrepreneur. Asia's company sells custom candles, T-shirts, mugs, bags, caps and necklaces -- all with her SBG logo. She still finds time to hit the streets to ask for donations, which is what led to her to successfully pitch her business to Quicken Loans founder and majority owner of the National Basketball Association's Cleveland Cavaliers, Dan Gilbert. She has also appeared on The Ellen DeGeneres Show, America's Got Talent, Disney World's Cinderella Stage, MSNBC, 20/20, ABC News and NPR. She also wants to open her own store in downtown Detroit, finish school, attend Harvard University, and perhaps become Mayor of Detroit -- or even President of the United States. It has been said that Newson understands business concepts better than some adults, so we expect to see and hear a lot about her in the next few years!